Adding New Payment Details to a Client Record and Managing Existing Payment Details. Learn how you or your client can add new payment details to PI, as well as options to manage existing payment details. Managing your client's payment details in Practice Ignition is easy as pie. You or your client can add and delete their payment details, as well as view expired payment details if there are any. Defining "payment details": this refers to any method of payment your client provides to you during the proposal process or through the other methods described below. 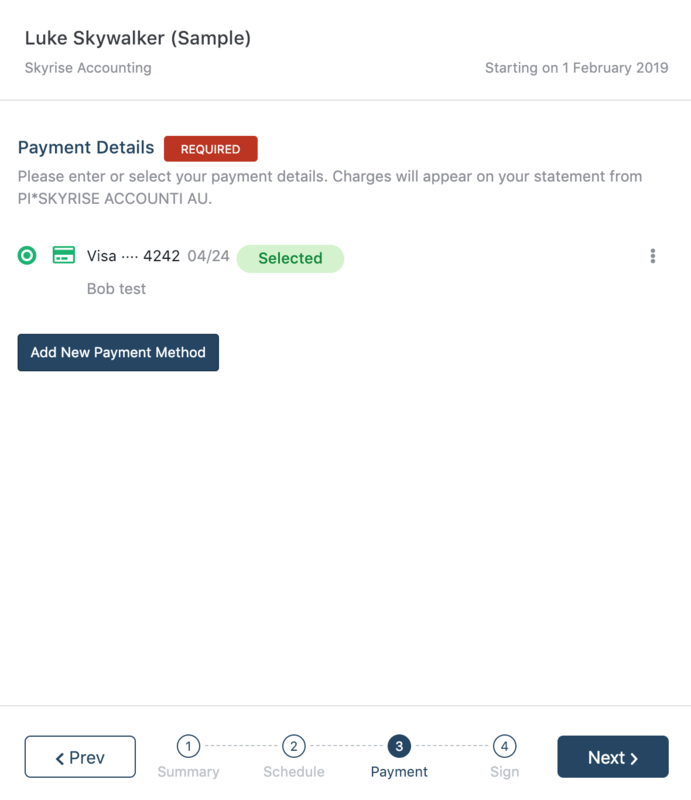 Here's a look at Manage Payment Details interface. In this example, there are two different payment details on file. 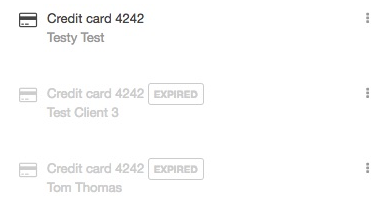 Expired Payment Details are grayed out if there are any. Expired payment details cannot be selected as a payment method and can only be deleted. You can delete a payment detail by clicking on the button beside the payment detail and choosing Delete from the drop down menu. Your clients will be able to enter their preferred payment method directly on the proposal you have sent them, just as if they were purchasing products on an e-commerce website. If payment is not required in the proposal, there would be an option to choose Arrange payment manually if your client decides to not have payments in the proposal. If you're happy to receive the client's payment information in person or over the phone, you can click Add New Payment Method to enter your client's payment details. Your clients can provide their Bank Account (in Australia or USA) or Credit Card details. 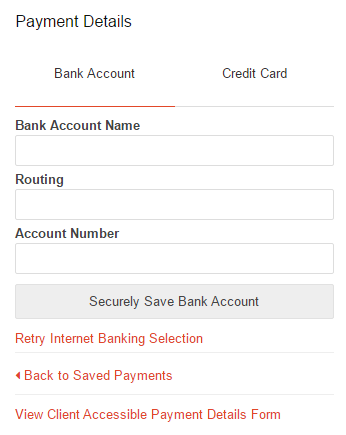 Choose which payment method you wish to use, enter the necessary details, and save. Note: we strongly advise against writing down the payment details or having the client send their details via email. This violates PCI Compliance. Entering it directly into the app as you're being told the details will ensure security of their details and ensure compliance. Another way for your client to access the Payment Details interface is through the Client Portal. Client Portal is a feature that you can use if your client wishes to manage their payment details themselves. This is useful if your client needs to add additional payment details after they accepted your proposal. US clients can also use their Online Banking accounts to verify their account. Check out this article to learn more. To access the Client Portal, go to Clients, choose a client, and click on Payments. 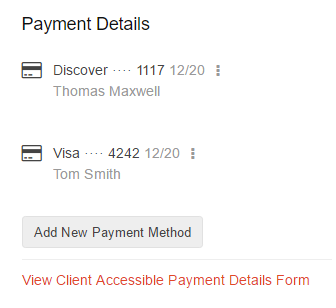 Click on View Client Accessible Payment Details Form. This will redirect you to a page dedicated for the Payment Details interface (as your client would see it). You can copy a link this secure Payment details form to send you your clients in your own email by clicking the 'Copy Link' button. If you use this method to receive new payment details, make sure you add the new payment details to any proposals you wish to collect payments, using the new details. Simply follow the instructions in the "Managing Payment Details on a Proposal" section below. 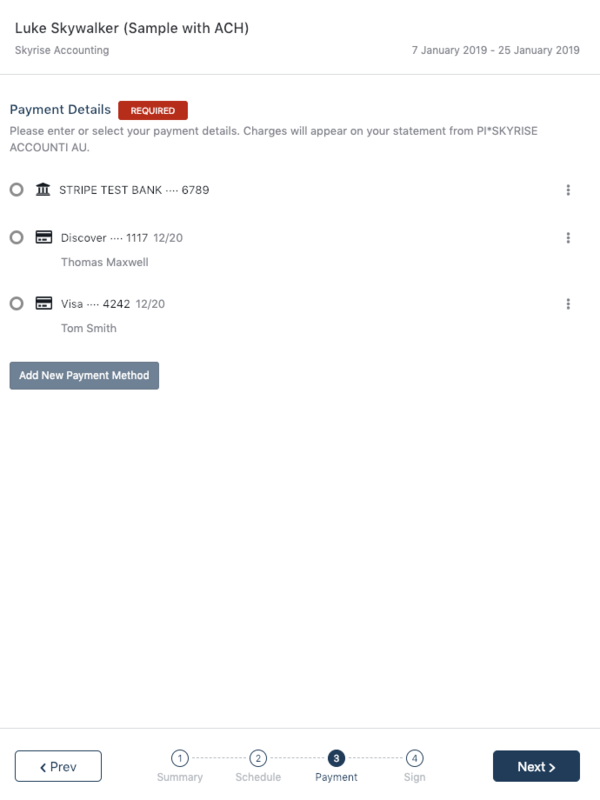 Below are three areas of the app where you can manage existing payment details, depending on what you want to do. Can you edit an existing payment detail on file? Unfortunately, you cannot edit an existing payment method, even if the expiry date is the only detail that has changed (for example). The details are stored securely for compliance purposes, so editing is not possible. Note: To remove an expired payment detail (or one your client no longer wishes to use), you'll have to remove the details from any proposals that they are assigned to, including completed proposals. The easiest way to do this is to select another payment method, or choose "arrange payment manually" on proposals that uses the payment detail you wish delete first before deleting it. Once you've received the new details, you can add them back to your proposals that you wish to collect payments on. Payment details can be managed on the proposal level. When viewing a proposal, go to the Invoices & Payments tab. Under Payment Details on the right hand side, click on Manage Payments. The Payment Details interface should pop up on the right-hand side. You can use the same functionalities here, as well as select which payment detail will be used for this proposal. Just click on the radio button beside the payment detail you wish to use. The selected payment detail is highlighted in green. Note: Changing a proposal's selected payment method won't change the payment method of your client's other proposals if there are any. delete a payment method they no longer want you to use. Bonus: For more help with using Payments in a proposal click here.